← Sign up for fresh produce this year… It’s CSA time! – mache AKA corn salad – this is the funny little salad green in the bag. It’s super cold hardy and slow growing. It was seeded in September! It’s got a unique taste and texture which I quite like as it is different from any other salad green I’ve had. Wash it well and tear into salad. I put it with the radicchio with oil, lime juice, salt, and pepper. mmmmm… I think that I’m harvesting this a bit late as it is bolting (starting to make flower buds), but it’s still tasty. – little overwintered cylindrical beets – I wouldn’t bother trying to peel these as they’re pretty small. Maybe just clean up the tops a bit and steam/saute/braise/roast? – parsnips – you may have to cut or peel off a few dark spots – these overwintered nicely but won’t last much longer in the ground. Perhaps roast in the oven with the beets? – radicchios – some of these are huge! If you got a big one it might have fuzzy leaves and might be a better candidate for a quick braising than for salad. If you are eating them fresh and want to take some of the bitterness off, a 20minute soak in cold water will help. 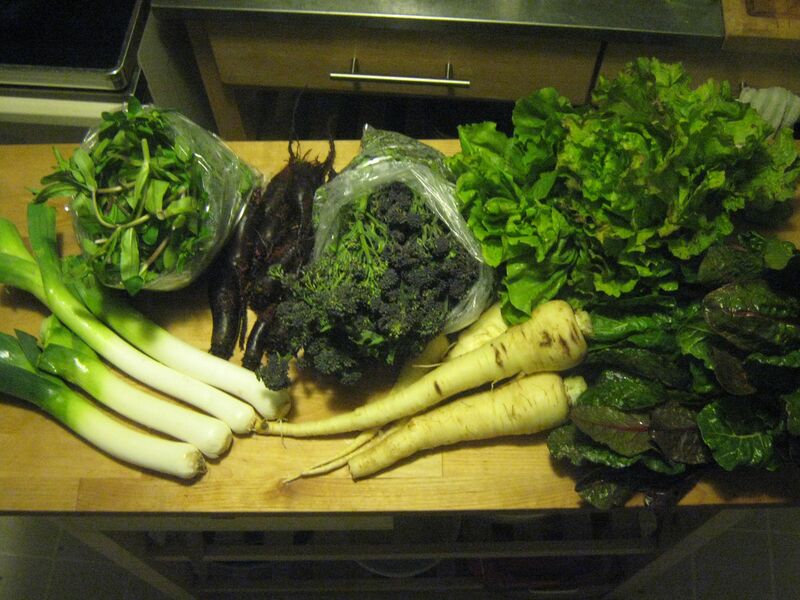 This entry was posted in csa and tagged corn salad, csa, Farm, purple sprouting broccoli. Bookmark the permalink.